What’s All the Buzz About, Honey? When it comes to health benefits, honey is a pretty sweet deal. It’s the perfect alternative to sugar, with a lower glycemic impact, and it actually improves health. If you have a sweet tooth you should always consider honey as a far healthier alternative to sugar or artificial sweeteners like aspartame. When it comes to your health — and meeting your weight-loss goals — honey is liquid gold. There are a ton of different types of honey — macadamia, pumpkin blossom honey, blueberry honey, buckwheat honey, organic honey, and so many more! But, not all are created equal. So, what’s the buzz all about “local, raw” honey? You should choose local, raw honey whenever possible. Your best possible option in ensuring you’re using the purest form of honey is to source it from a local beekeeper. Check out the booths of your local farmer’s market to find someone who can point you in the right direction. You can also look into a local beekeeper’s association or local raw honey association (yes, there are such things!). Do you use chemicals or other treatments? Do you feed the bees yourself? In what type of structures are the bees housed? Are the bees ever moved around? Is the honey filtered in any way? But finding a beekeeper isn’t the most practical solution for everyone, so your next best bet is to select local raw. 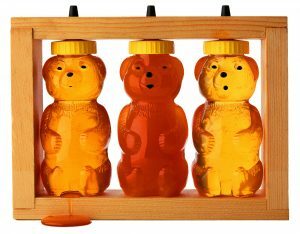 According to a recent report by Food Safety News, much of the honey sold in the United States doesn’t meet the true definition of “honey.” Why? It’s over-filtered. That’s why you need to look for local, raw honey that is unfiltered. Don’t worry, it’s much easier to find than it sounds. You’ll find an entire shelf of different types of honey in just about any grocery store. Just make sure to read the labels to ensure that the one you select is truly unfiltered. Stores like Whole Foods, Sprouts, or Vitamin Cottage generally have the widest selection. Now, let’s talk more about why you need to substitute your sugar for honey immediately. Sugar is sugar, and while honey also contains sugar, your body has an easier time breaking it down. 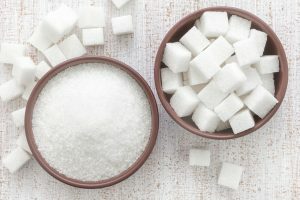 Sugar is made up of 50 percent glucose and 50 percent fructose, and since the body breaks this type of sugar down very easily, it leads to a rush of blood glucose and any leftovers get stored as fat. As for honey, it’s only 30 percent glucose and 40 percent fructose, but also contains more complex sugars so the body takes longer to break it down, therefore you don’t accumulate as many calories. Since raw honey is natural, it doesn’t contain additives or preservatives. It’s also completely versatile and can be used just like sugar in just about anything — coffee, tea, yogurt, granola, many baking recipes and so on! Honey provides an abundance of benefits, not only for weight loss, but for your overall health. Here are just a few. Helps With Allergies and Illness: Honey has anti-inflammatory properties, which is why a little lemon and some honey is the most natural way to soothe a sore through from a cold or allergies. The pollen in honey acts like a natural vaccine. Once ingested, your body starts to produce antibodies, fighting illness and lowering the intensity of your allergies. Gives You Energy: Energy drinks and specialty coffees have a ton of sugar and calories, but honey is a natural energy booster! Because it contains both glucose and fructose it provides a quick and safe energy boost. Immunity Booster: Honey contains anti-bacterial properties and antioxidants that help boost your immunity. Mix honey and lemon into a cup of water and drink it upon waking for a cleansing boost! And thanks to those antioxidants and additional flavonoids, honey may prevent some cancers and heart disease, too. 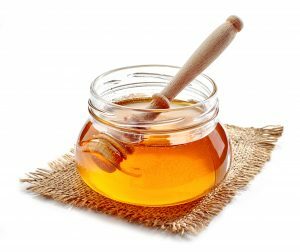 Improves Athletic Performance: If you’re an athlete, you may want to add honey to your cabinet. Not only does it maintain glycogen levels for energy, it also helps with recovery time. In addition to all the benefits honey provides inside the body, it actually does wonders for your skin too. It can be used to treat dandruff when you make your own conditioner using honey, and it can also be used in homemade facemasks or scrubs. You’ll find plenty of DIY honey beauty masks online, including those that are mixed with yogurt or oats. Honey is also the perfect for aid for treating burns and wounds. 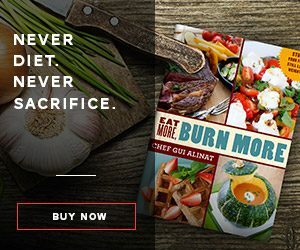 To learn more about cooking delicious, healthy meals that swap unhealthy ingredients like sugar for healthy ones like honey, check out Chef Gui Alinat’s Eat More, Burn More C ookbook. On page 217 you’ll find a delicious recipe for Easy Granola Bars that are sweetened with honey instead of the corn syrup typically found in store-bought granola bars. This is just one of the more than 100 recipes in Eat More, Burn More that offers healthy, metabolism-boosting ingredient swaps. To the Sweetness of Your Health!